Adriaan Boshoff was born in Pretoria in 1935 and passed away on 18 April 2007. Adriaan was one of the great impressionist painters of our time. 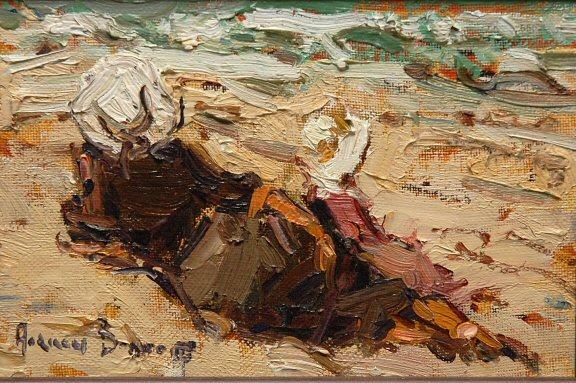 He was a self-taught painter of landscapes, seascapes, still life and figures. He worked in oils and became known for portraying everyday scenes in his unmistakable impressionistic style. His work has been exhibited to acclaim around the world and is collected by enthusiasts from New York to Auckland. He was a reclusive man, an artist who was only really happy in his studio surrounded by paint and canvass. Adriaan embraced Christianity with all its tenets and strictures. His faith seemed to have helped him discover the inner peace that had so eluded him in his early years – and it is this peace that the art lover sees in the maturity, the grace and, indeed, the serenity of his work. Adriaan Boshoff was first and always a South African and some of his most memorable works are landscapes depicting the veld with cattle crazing. If Boshoff could be said to have a trademark, it would be that singular ability to express the passing moment in such a wide variety of work. This was supported with a technical ability that is first-rate and an understanding of colour and harmony that is, quite possibly unique, at least in South Africa. “Love my country, its people - especially its children, and its natural beauty. In my work I endeavour to portray things in a way which people are able to understand. I enjoy capturing scenes and images I see and experience around me, as I perceive it - as it impressed itself on me. For this reason I often revisit painted scenes to ascertain whether my interpretation was correct. I have found a certain measure of realism in my life, and that is what I seek to share with others. Every work I do must be better that the previous one. I have not produced my best work yet. Perhaps it will be the next one... or maybe the one after that." Like so many great artists, he did not work quickly – he often progressed laboriously to what the untrained eye may acclaim to be the perfect canvass, only to tear it up and start again. He was his own, most austere critic. Boshoff’s often large canvasses evidenced a rare understanding of colour and balance and that essential ability to capture the fleeting impression that is the very essence of Impressionism. He was unreservedly a romantic impressionist, a man who could retain the precise nuance of an expression he wished to impart. This imbue his characters with that upturned glance – that arched smile – that made his paintings come alive and create a rare accord with the viewer. If any art can be termed an investment, Adriaan Boshoff’s work indeed comes closest.